Please welcome Micheal Brims to the SAB Team. Find out more about our new website and Twitter accounts. The Safeguarding Adults Triage Team is a newly formed, small team, of four permanent social workers and a student social worker. 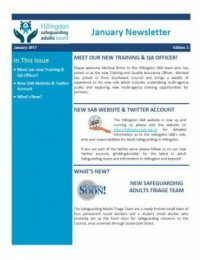 For more information on the above topics, please read the full Newsletter below.